my struggle with my perfectionist side. There are so many who are struggle with this. we feel we are less than. I have learned in my struggles in my journey. perspective of my life and myself. word out in the world. its part in my life until I learned more about it. we are strengthened in our weakness. will show unto them their weakness. He gave us our weakness to humble us. I love the word humility! It is packed full of an amazing lesson. (Hall, Kevin. Aspire, pgs. 111-112). people He created us to be. trying in my own ways to do things in my life. Heavenly Father to help me. (even if it took a lot of time). I could not do on my own. when I wasn't strong enough to do it myself. but it all has a purpose. our Heavenly Father in our lives. that we have power to do these things"
I know that Jesus Christ lives! that we never could have done alone. the beings we were created to be. and you will see miracles! I know you will see miracles! As always we love you! This is a topic that has peaked my interest as of late. 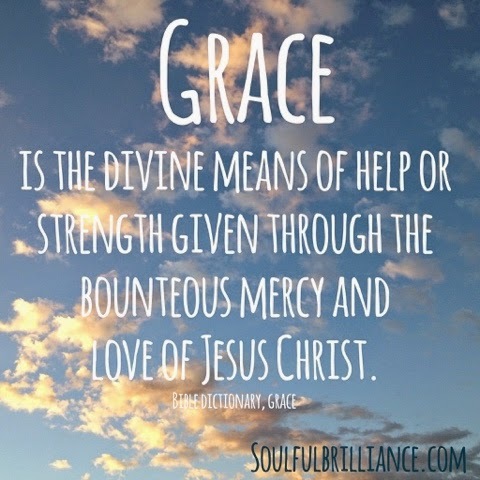 When I knew the topic was Grace, I wanted to look up the definition on the word. There were definitions I was familiar with but one stood out to me. Grace: do honor or credit to (someone or something) by one's presence. I have always had a sense of the word grace being that of Christ making up the difference when we cannot do it all but never to honor or give credit. I then began to look up talks on grace and found this analogy that really brought a new perspective to the word grace. “Christ’s arrangement with us is similar to a mom providing music lessons for her child. Mom pays the piano teacher. Because Mom pays the debt in full, she can turn to her child and ask for something. What is it? Practice! Does the child’s practice pay the piano teacher? No. Does the child’s practice repay Mom for paying the piano teacher? No. Practicing is how the child shows appreciation for Mom’s incredible gift. It is how he takes advantage of the amazing opportunity Mom is giving him to live his life at a higher level. Mom’s joy is found not in getting repaid but in seeing her gift used—seeing her child improve. And so she continues to call for practice, practice, practice. at Brigham Young University on July 12, 2011. For the full address, visit speeches.byu.edu. We are given a great opportunity to be on this earth and to live each day so that we can return to our Heavenly Father. Christ paid our debt in full and in return He asks us to, simply, “Follow Me”. Does He want us to pay the debt of sin back? No. Does how we live our lives repay the debt He made? No. Living our lives by keeping the commandments, reading our scriptures, saying prayers, helping those around us and doing anything we can to feel the spirit in our lives is just the start of showing Christ and our Heavenly Father our appreciation. Even though we may not understand along the way, these things are to help us be better and live on a higher plane. I’m going to be reading about Christ’s life this month and I will report it on the next blog. Hope to hear from you guys on what you did. If you don’t want to respond on the post please please please don’t go through an awesome experience without recording it in your journal.